Czerwik of Brighouse is well known for its fun cheese and wine tasting evenings which have been held for many years in the shop at Brighouse on a private party basis for groups of friends, family etc. who want to celebrate an event – or simply just to get together for a fun evening. 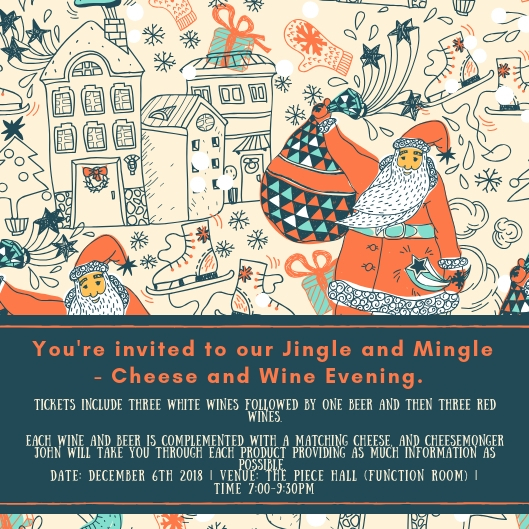 Business for Calderdale is lucky enough to have secured owner of Czerwick and master Cheesemonger John, for the BFC Christmas cheese and wine evening at the Piece Hall on Thursday 6 December, 7:00pm-9:30pm. There will be three white wines followed by one beer then three red wines. Each wine and beer is complemented with a matching cheese, and John will take you through each product providing as much information as possible. The theme for the tasting is simple ‘have fun’ so the whole evening takes on an informal and relaxed atmosphere. John is around to answer any questions you may have on any of the wines or cheeses experienced during the tasting. There are 50 places available tickets are £25.00 per person and can be booked through Eventbrite. This entry was posted in Events, Nov and tagged Business For Calderdale, The Piece Hall.